Welcome to Riverdale, a place where nothing is as it seems. Buy, sell and trade your way through the town from Pop's Chock'lit Shoppe (home of milkshakes, meetings and murder) to the mysterious Sisters of Quiet Mercy (the mysterious locale with secrets all its own). Choose from custom sculpted tokens like Archie's Guitar or Veronica's Pearls, and show your inner Blossom trying to bankrupt your friends and win it all! 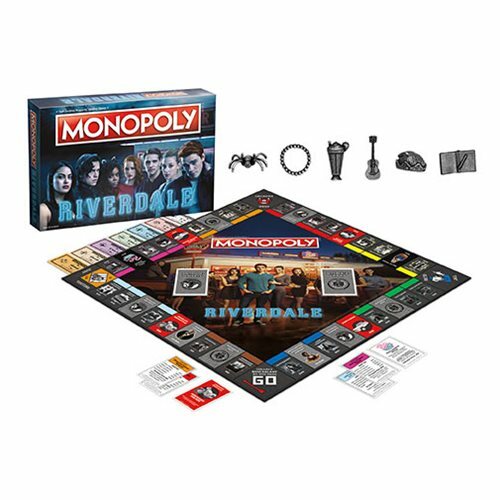 The Riverdale Monopoly Game is a great addition to your next game night. For 2-6 players. Ages 15 and up.